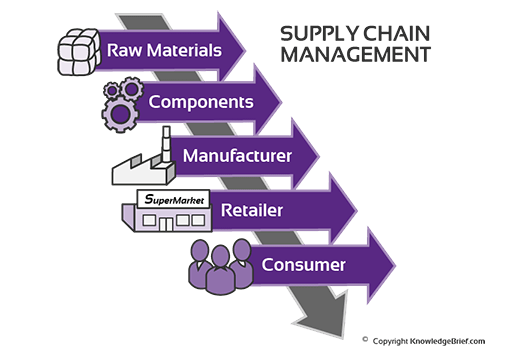 The supply chain is a network of organizations, resources, people, activities, and information needed to get a product or service from a supplier to a consumer. It can also be a sequence of steps or processes involved in the production and distribution of a good. Simply, a supply chain transforms raw materials into a finished product that is delivered to the end consumer. A supply chain includes the suppliers, manufacturers, and retailers that distribute the product to the end consumer. It includes every business or organization that comes into contact with the product, including third-party manufacturers or assembly companies. Supply chains differ from logistics management, which refers to the production processes and distribution within the business or organization, and not to the end consumer. A typical supply chain begins with the ecological, biological, and sometimes political regulation of natural resources. After this follows the human extraction of raw materials for production; there can be several steps in production, including component construction, assembly, or merging before the finished product. Once the finished product is completed, it is moved to various storage facilities until it ultimately reaches the consumer. Supply Chain Management (SCM) is the active management of supply chain activities to maximize customer value and achieve a sustainable competitive advantage. It is a conscious effort to efficiently and effectively manage processes like the movement and storage or raw materials, of work-in-process inventory, and of finished good from the point of origin to point of consumption. Supply chain management is the integrated, end-to-end process of design, planning, execution, control, and monitoring of supply chain activities to achieve value and a competitive infrastructure, while meeting global demand with ample supply. Many of the exchanges within the supply chain are between different companies, each seeking to maximize their profits without knowledge or concern for the other suppliers. When they form a cooperative network that groups their products and services together they are referred to as an extended enterprise. With a focus on ethical standards, many companies are enacting codes of conduct and guidelines into their supply chain management practices. Companies ask their suppliers to comply with these demands and verify through social audits that they are following the proper standards. Supply Chain Management is key to profitability and quality of production — an optimized supply chain can lower costs and speed up production cycles. Many businesses define success with their supply chains in terms of freight, warehouse, and other costs instead of understanding the true, deep impact supply chain management has on overall value to both their customers and business. By focusing on metrics about specific steps of the supply chain, they fail to look at the entire process holistically and miss the opportunities for competitive advantage when creating their end product. Establish a governing supply chain council to direct and align strategy with the overall company’s goals. Utilize technology and advances to optimize efficiency, collaboration, and alignment in the supply chain process. Establish alliances with key suppliers. Improve supplier performance wherever possible. Engage in collaborative strategic sourcing. Increase inventory velocity to keep products moving. Take environmental or “green” initiatives and social responsibility standards seriously.